I’m in for the October Challenge! This may be just the push I need. Why would I pass that up? Plus, if I succeed, I’ll be a whole dollar richer! Anyways, no idea what I’m going to do yet, but I’m in. So, I finished. I’m not sure it’s much of a game at all, let alone a not-game, but I managed to come up with another idea and finish the game. And throughout all of it, I managed to keep the awesome 50×50 resolution. – I didn’t have enough time to work out all the technical stuff. I was trying to add some more life to the world, which is what the birds are for, but I didn’t have the time to come up with some good ideas. – I only spent like 6 or 7 hours on it in total. Out of two days, I only worked 6 or 7 hours. I probably spent at least half of it working out all of the details of the real-time system. I only worked when I had new ideas and all, so it makes sense, but it feels a little lacking in time spent, and the game probably reflects that. – For some reason, the “pixel-perfect” collisions weren’t exactly pixel-perfect. I have it set to do pixel-perfect collisions, but the caveman keeps catching on things at the borders of his invisible box. – I’m not sure how much of a game or a not-game it is. It’s not much of a game. Just explore 4 small rooms and then return to the cave and it’s over, pretty much, but at the same time, I feel like it’s too much of a game to be a not-game. I started out thinking “YEAH! I’m going to have a ton of ideas for not-games!” Nope. Not good ones, at least. Alright, so it’s sort of done. It works, it has some interactions, and I’m not really sure where to go with it now. If you’ve got an idea, leave a comment. Oh, and you’ll notice that I included all the images, sounds, etc. Yeah, I figured I’d package it all up. And since I’ve been fighting with sounds to behave right, don’t stand on the gray pedestal thing too long or it’ll crash. Mostly, I’m wondering if it really needs more for this jam, or if it’s sort of good where it is. It’s only the first day I’ve been working on it just yet, though, so I’ve got time to implement stuff tomorrow if I can come up with anything, or I like an idea posted here. 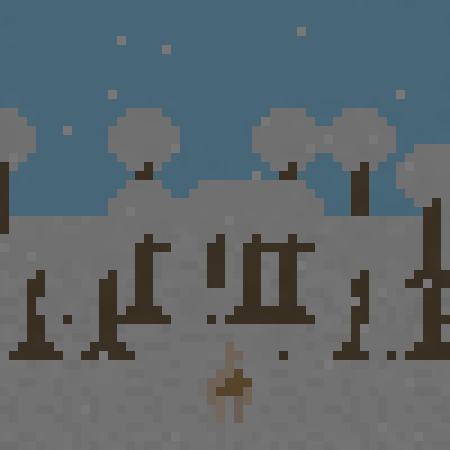 Oh, and arrow keys to move, Spacebar to throw your spear, walk over your spear to pick it up. Got sabertooths in. They start the chase from further than the deer start the running, but they are still visible when they start chasing you, and they run slower than you, as opposed to the deer that run faster than you. If you get caught by a sabertooth, it’ll kill you and cause the game to reset. I also added a way to get back to the cave, and fixed the day part of the day/night cycle (sunrise/sunset worked, but I typed something wrong and day was night :P). Onto level design and interactivity! So after getting a random burst of energy, I decided to put the deer’s AI in. It’s a deer! And spring showers! It’s not perfect, but it’ll definitely work. The only issue is that it can get stuck at the bottom of the map (though still visible and mobile). I’ll have to work something out. 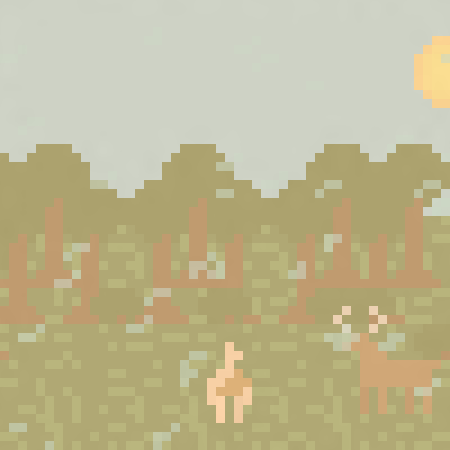 Right now, the deer will cautiously watch you, and then run away if you get too close. So I scrapped my other idea. I want to do that at my own pace another time and do it true justice with a lot of random events. 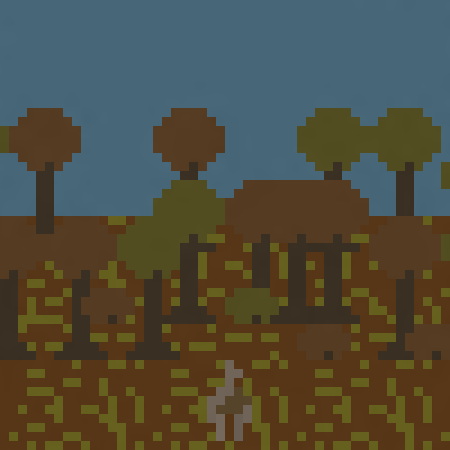 So tonight (like 2 or 3 hours ago), I (finally) got started on a new idea for a game, based on a caveman. I’m not really sure where it’s going yet. The fact that I want to do a not-game is pretty restricting when it comes down to it. It really shouldn’t have anything that resembles gameplay, which is really making this difficult. 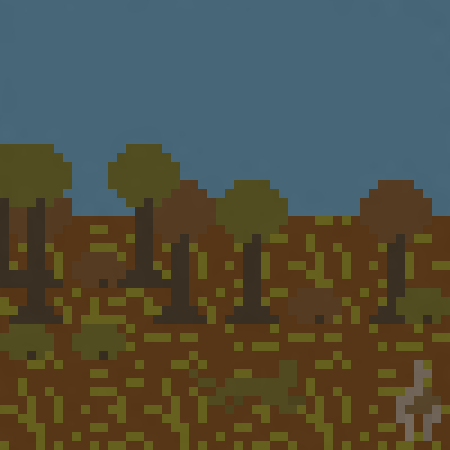 So far, I’ve got a day/night cycle (basically just an overlay that’s either visible or invisible based on the time of day and a sprite that changes from a sun to a moon and back again) that supports sunrise and sunset, seasonal textures (one set for spring/summer, one for fall, and one for winter) and rain for the spring to differentiate it from the summer and snow for the winter. 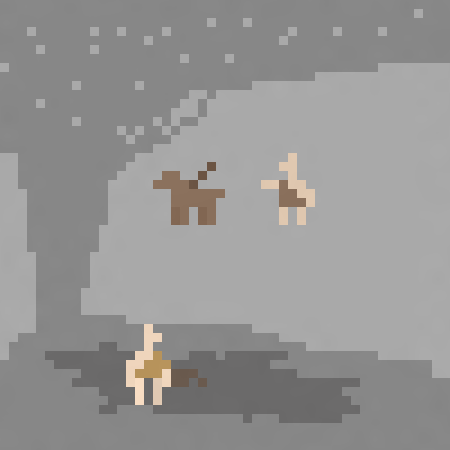 I also have a cave with a cave painting and a fire that’s currently out. EDIT: Finally got a pic of the sunrise. Decided to wait until it was time for it. And then I have a caveman that throws a spear in an arc, and has to retrieve it if he wants to throw it again. From here, I plan to add a sabertooth tiger, a deer, and maybe something like a raptor. And then I’m not sure at all. Once they’re in, should I make it so you can hunt them? The monotonous task of hunting day by day? Is that not-game-y enough? Guess we’ll have to see where it goes from here. EDIT: Did I mention this is all done in 50×50 pixels?! Super-low res ftw! So I have this grand idea, the life of a middle-schooler, with random events, and the world flowing in real-world-ish time, where you’d actually have to go to school and sit in class for so many hours, and all, and you could close the game and come back after school and it’d be dinner or something. But I realized that that’s a bit overly ambitious, and I’m not sure if I can do it justice in the time I’m given (after losing most of the day, I have like 7 hours-ish until the compo is technically over, and only a few days after that, I think, until the end of submissions). So I think it’s back to the drawing board, but if I can’t come up with anything else really soon, I’ll probably attempt it anyways. Well, I’ve been thinking it over for a while, but I think I’m in for the MiniLD. I’ve got a few ideas brewing, but in general, I’m not quite sure yet. 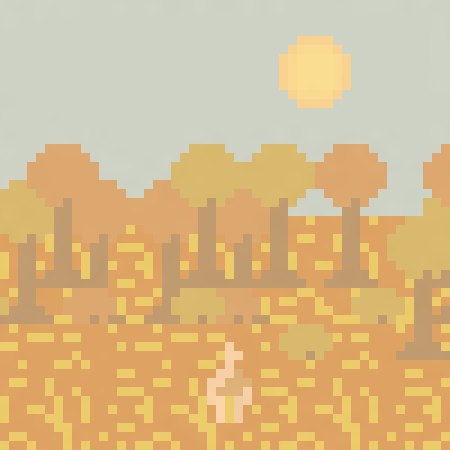 Anyways, time to challenge myself to make a personal game with some time-dependent elements in 24 hours or less! EDIT: I’ll probably be using Game Maker 8.1 and GIMP, maybe SFXR. 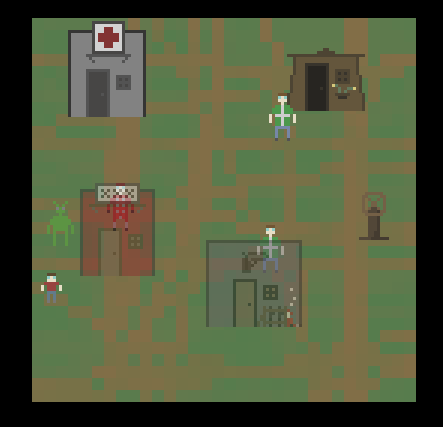 Alright, so this was my first Ludum Dare. It taught me quite a bit about time management, and about how to cut down overly-ambitious ideas. My original idea was to create something somewhere half-way between Populous, Civilization, and Escape Velocity. A sort of roaming through the stars, while civilians were mostly automated, but needed some interaction, and some enemies that reared their ugly heads every now and then. Clearly, I had to cut that down a lot. I barely managed to get anything automated, and what I did get automated frustrated me to no end and still doesn’t entirely work. Lesson #1: Don’t attempt to create a game of a genre you’re unfamiliar with for a competition based on developing at a rapid pace unless you’re damned sure you have the know-how. Then there’s the matter of implementation. 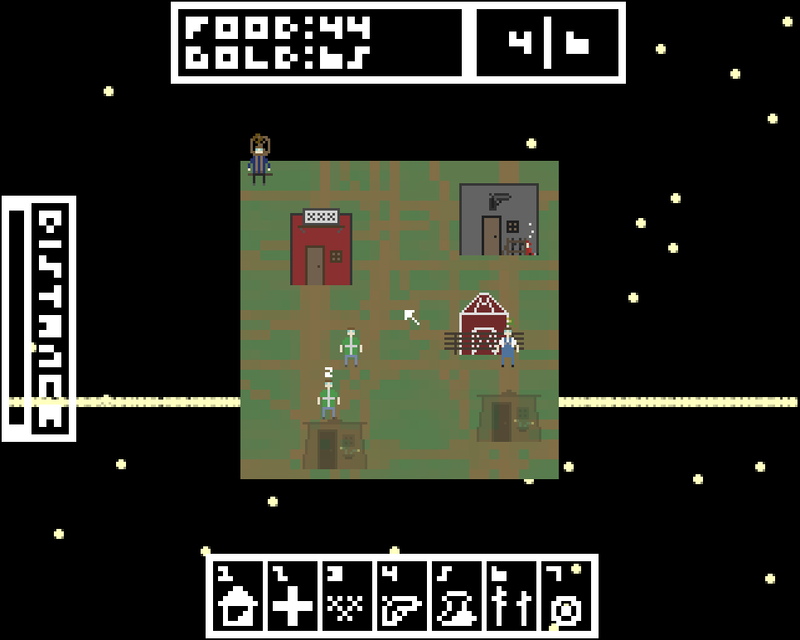 I’m slowly learning that I need to make sure to have people ready to test my game, because despite all of the posts coming in, there seemed to be little to no feedback from anyone on just about any of them. As such, my implementation probably suffered a bit. Difficulty scaling was one of the big things that just sucked for me, since I was the only one really testing it out. The controls are a bit unintuitive. However, I got used to them. Others might not, and that may reduce the fun factor a bit (or perhaps more than a bit). Lesson #2: Make sure someone else plays your game (this should probably be true of ANY game dev project, but it’s something I forgot in the rush of creating a game in 48 hours). Then there are the graphics. The graphics in my game could probably be regarded as mediocre at best. They work though, or at least I think they do. They were designed to fit the time that I had. I probably could have done a bit better, had I known I would have had the time. Lastly is the sound. I literally just took SFXR and hit each button over and over again until I found something I liked for each event. For the music, I just threw something together out of a few riffs with some heavy delay and medium flange. I didn’t even bother making sure that I kept in time the entire time. Just kind of haphazardly threw it together and hoped for the best. Lesson #3: Don’t haphazardly throw stuff together and hope for the best. Anyways, that’s my write-up on my experience with LD. I look forward to playing all of your games, and hope to be back for LD24. Well, I made a simple music track (did I mention it’s a bit off-tempo?) and put together a short how-to (which probably isn’t enough. I wanted to do a visual one, but I just wasn’t awake enough). Knowing how annoying spacey music might sound to some, I also added a way to turn off the music, appropriately mapped to the M key. I’ll be glad to change anything based on suggestions while I still have time. I added sound to IPSA. They’re just a few basic sound effects made with SFXR, but it adds to the experience. I think I’m going to do a basic background track for it sometime today. Then maybe change the end of the game from a pop-up to a screen of some sort (well, two, one for winning, one for losing), and then it should be done. Turned out to be more of a “careless mistake”. I had had the icons that appear over characters’ heads check every step to see if they were still above their original “target” and if they weren’t, then they would implode. That check was set BEFORE the parts of the code that relied on the existence of that object. I had thought that simply having that check would keep me from needing to check if the instances existed, since the object was supposed to destroy itself beforehand. Nope. Turns out I needed checks for every different type of object call I made, to make sure it existed. And so I fixed it. Hopefully. And hopefully that’s the last game-crashing bug. Next up, sound. Then the How-to. EDIT: Oh, forgot to mention before. Due to the way it scales to; 1. Allow sprites to be decently visible, and 2. Allow everything to fit on screen without looking cluttered, it runs at a fixed 960×768 resolution. Yes, it’s weird. It’s fullscreen by default to accommodate the fact that most computers seem to run in either 1024×768 or 1366×768 mode nowadays. This is Interstellar Planet-Ship Adventures: The Search For…Holy $@#% Aliens!!!!!! …or IPSA for short. After cutting back and cutting back from the original design document, I’m almost done with it. Just a few things left to do. One being squash any and all bugs that may still exist. Another being balance. The last being sound. If anyone’s interested, I need two things specifically: Bug reports, and any comments on the difficulty level. It starts in full-screen automatically, and may act weird on certain setups. I don’t know really. It works fine on my computer. IPSA is sort of halfway between a strategy/god-game and an arcade game. It’s also probably really difficult, if not impossible. The difficulty hasn’t been fully tested. The goal of the game is to get to the required distance from where you start. That’s it. There’ll be obstacles along the way, though. Left-click: Select/deselect a unit. You can only have one unit selected at a time. If you have one selected, left-click anywhere on the planet to move him. Right-click: If you have a youth selected, and the youth is standing at a station/building, then right click on him to begin him training. Save for the brothel, he’ll become the related unit. 1-7: Create the building listed at the bottom of the screen at the mouse’s position if you have the required amount of gold. Each unit has 5-15 HP, depending. After a certain period of time (I think 50 seconds), the unit has to return to a house to sleep. Once they’re done sleeping, you have to manually send them back to their stations. 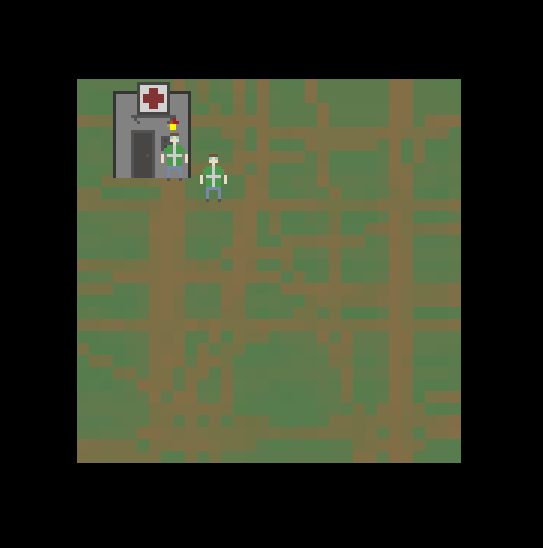 Units are a little glitchy, so try to keep the path between their station and the nearest house clear. There can only be 3 units per house that is active at any one time. To use a station, unless the unit is a youth, they just have to come in contact with the station. Citizen: Can use the brothel to create youth. Youth: Can become any of the other units. Captain: Can only be one. Required for the planet-ship to move. Militia: The only units that fight back when the aliens attack. Doctor: Heals other units. Can only heal one at a time. Scientist: Cleans up the plague caused by asteroids. Farmer: Gathers food. YOU ABSOLUTELY NEED FOOD. Each unit consumes food. If food goes below a certain point, game over. Each obstacle drops gold after being dealt with. Asteroid: Falls on your planet and destroys anything it hits instantly. Plague: Causes a damage-over-time effect for all units but scientists. Alien: Attacks the nearest unit. And I hope that’s enough to get you started. Good luck, have fun, and I would really appreciate it if you report back with any problems you have. There are aliens! And soldiers! And the buildings turn partially invisible when you walk behind them! I’ve been making quite a bit of progress since waking up an hour ago. The more I work on it, the more this game feels way too ambitious for the scope of Ludum Dare, but I’m not entirely sure how to simplify it any more than I already have, short of taking out entire segments of gameplay, removing any of which defeat the originality that was there to begin with, however large or small an amount of originality that may be. Not the best looking game, but hopefully the gameplay can make up for it. I don’t have time to make the graphics any better. Unfortunately, you can’t see a whole lot of the progress, due to it mostly being behind the scenes. Even so, I can’t help but feel it’s still way out of reach for LD. Here’s hoping I can finish this monster. Wasn’t sure if I was going to use the blog at all. Turns out I am, and I’m in, and I’m going to be using Game Maker, GIMP, and either SFXR or Garageband for sound effects. Maybe both. Who knows.